The old pass/fail view of counterterrorism is evolving towards a containment and mitigation strategy. During my FBI career as a Special Agent and ultimately Assistant Director, the FBI, police, and domestic security agencies viewed terrorist incidents through a black and white, binary lens. If we “allowed” an attack to happen, we had failed. If we prevented an attack, we had succeeded. Yet, the increase in lone wolf, soft-target attacks — particularly attacks where trucks and cars are driven into large, vulnerable crowds — can actually be viewed as a symptom of our success. The Halloween terror attack that occurred in New York City raises an important question: Do we need to change the way we deal with so-called “soft target” attacks? As I write this, there are reports that the Halloween attacker entered our country in 2010 from Uzbekistan, shouted what sounded like “God is Great” in Arabic, and left a note in his rented truck stating something to the effect that he was inspired by ISIS. If this reporting is accurate, it is possible that our old binary lenses may actually distort our view of this increasingly popular form of mass terror. And if this is true, we must immediately analyze our strategies. Without adapting, Americans could eventually find themselves in a country where the rental of a truck requires a background inquiry akin to a gun purchase, and the reservation of a hotel room requires a search for sniper rifles. Some context is required here. The global war on terrorism, with its methodically strategic excision of terrorist leaders around the world, succeeded in virtually eliminating the capacity of ISIS, Al Qaeda and their affiliates to execute large-scale attacks in the U.S. Our military, intelligence, and law enforcement agencies have impressively shortened the life expectancy of terrorist leaders and forced massive turnover at the top of these types of organizations. These successes on a global and structural level, however, have not and likely cannot prevent online radicalization. This plague has influenced several recent soft target attacks, and likely was a factor in the New York City attack. 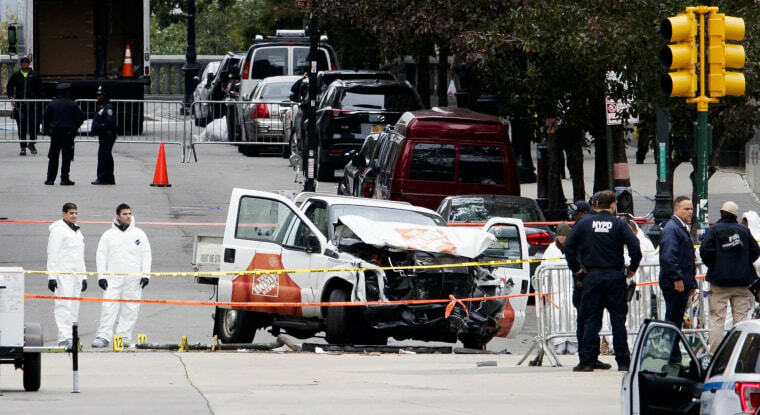 We know that ISIS has publicly called on its followers to drive trucks into crowds. We also know that terror organizations, including ISIS, have become savvy social media users. Indeed, the power of social media to influence, recruit and radicalize across spectrums and ideologies is also part of our new normal, whether the soft target is a bike path in New York or the brains of Americans exposed to Russian propaganda before the 2016 presidential election. This aspect of our new normal comes with frustrating decentralization, difficult attribution, and challenging questions for all of us. C. Frank Figliuzzi is the former Assistant Director for Counterintelligence at the Federal Bureau of Investigation. Before that, he served as the FBI's Chief Inspector, overseeing special inquiries including all reviews of the use of deadly force by FBI agents worldwide. He currently is the chief operating officer of ETS Risk Management, Inc. and a national security contributor for NBC News.